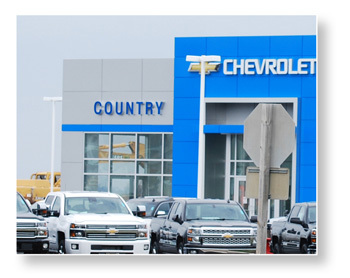 Country Chevrolet in Herscher is a quality Chevrolet dealership in Herscher, Illinois, that serves the entire Chicago–Naperville–Michigan City region with new & used Chevy cars, trucks, and SUVs. Our Herscher dealership offers a great selection of new and used Chevrolet vehicles, like the new Silverado, Impala or fun-to-drive Cruze. From our site you have the opportunity to view the entire Country Chevrolet inventory, choose a Chevy model, calculate your payments, request Chevrolet financing, and even receive a quick quote. We invite all of Kankakee County and the surrounding area to stop by the Country Chevrolet dealership in Herscher, IL located on 110 South Main Street. Feel free to contact us anytime with your questions at Country Chevrolet in Herscher!